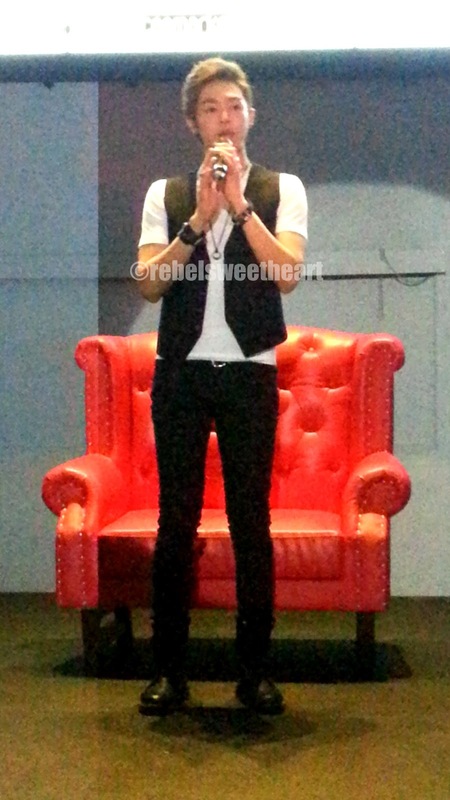 Kpop artist Alexander Lee Eusebio (or simply Alexander to us Kpop fans) is in town! He'll be having a Fan Party on Saturday (July 27) and will appear live on Sunday (July 28) at KFest4. Prior to these events, I had the privilege of seeing him up close and personal at yesterday's press conference. Held at KPub BBQ at The Fort Strip, the press conference was attended by media outfits, fellow bloggers, and some of Alexander's fans. Kring Elenzano was host for the said event and was the first to throw a question at Alexander - how it feels like to be back in the Philippines. "Has it really been three years?" Alexander asked, his eyes beaming at the crowd. It's been three years since Alexander's last visit and except for the fact the he is now a solo artist, the former UKISS member is still as bubbly, cheerful, and handsome as before. "I missed halo-halo!" Alexander said. "You've seen my photo eating halo-halo?" Alexander talked about his upcoming movie, 3 Peas in a Pod, where he plays the role of Peter Park. He admitted that he's nervous with his silver screen debut, but doing the movie was a fun experience. Alexander also spoke of his co-star Calvin Chen, who was a good hyung (that's Korean for elder brother) to him. 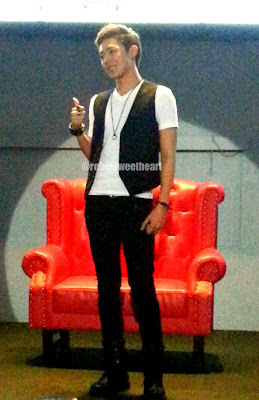 The program went on with a Q&A portion, and Alexander gamely answered the questions from the media people and his fans. I'm not going to name my son adobo! Haha. When asked if he misses being in a boy band, Alexander admitted that he does. "When I was in UKISS, each member would take turns on answering questions, and when we go on the stage to perform, each one would have different parts. But now being solo, sometimes I really wish that they would help me with the workload and make me stronger." The 25-year old also didn't have qualms in saying that he would like to perform again with the group. "I don’t know when but I’m sure it will be exciting.," he added. Alexander, who has dabbled into singing, dancing, modelling, and now acting, was also asked if there are any other things that he would like to try. The crowd went wild when the idol star answered, "I want to try to be a husband. I want to find a girlfriend, later a wife, stuff like that..." A wave of laughter then erupted as Alexander protested, "But no I’m not going to name my son ‘adobo’! Because there's a rumor saying that I’m going to name my son ‘adobo’. No!" 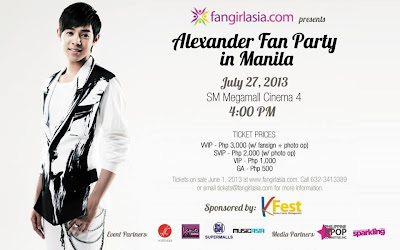 As for his Fan Party, the Kpop star said that the fans should expect 'a not so fake Alexander' during the event. "I want to be more like myself," he stressed. He also promised to sing a Filipino sing, to which he has listened to several times. The press conference ended in a happy note, with Alexander thanking the media and inviting everyone to his Fan Party in Manila, which happens later at SM Megamall Cinema 4 at 4PM. Hope to see you there! Frankly, I didn't know him until I read your blogpost. Heehee! I wish I've seen you. Alexander and you would make a lovely pair, hehe. He's part Portugese, part Chinese, and part Korean. Dami no? Haha! I'm not a fan of Korean dramas/singer so not sure who he is, but my friends who are die hard Kpop fans surely went gaga over this! I'm not really all that familiar with KPop so I don't know who Alexander is. But I can imagine how excited his fans were when he was here. I'm sure a lot of them were starstruck! This so funny because I know very few kpop artists, the new generation kpop artists I can't identify their names anymore. I just find them look the same, lol. Thanks to your post, I got a glimpse of him,lol. I dont know him either but maybe i'll check his movie once released. I have no idea who he is! It was nice learning more about him though. I'm sure fans are very happy to see him!